Concrete Alternatives has been raising and leveling concrete (mudjacking) for over 10 years, fixing common problems with sunken, uneven concrete slabs. At a fraction of the cost of replacement! Most projects can be completed in 1 day. We can raise the slabs, treat the cracks, seal the joints and return them to their original safe, functional purpose. In addition, we offer a variety of concrete coatings, sealers and decorative products to restore and/or enhance your concrete surfaces. We have a solid reputation working in the residential, commercial and industrial markets. We service all areas of Northeastern Pennsylvania. We’re always happy to discuss your specific needs and offer appropriate solutions with a free estimate. Our process is simple. We drill a series of strategically placed holes, inject a grout mixture under pressure to float the slab back into place. We patch the holes with concrete. Done! All at a fraction of the cost of replacement. Protect your concrete surfaces from water intrusion and erosion. We offer a variety of repair products and solutions. We have many options for protecting and enhancing your concrete surfaces – clear and colored sealers, concrete stains and epoxy coatings. We specialize in decorative epoxy garage floors that are beautiful and durable! Call Today for a FREE Estimate & Proposal! 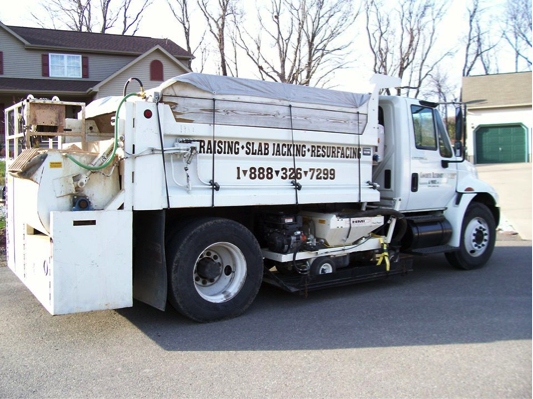 Based in Drums, Pennsylvania, Concrete Alternatives provides mudjacking, leveling and concrete repair services to homeowners and businesses throughout the region, including Scranton, Wilkes-Barre, Hazleton, Kingstopn, Berwick, Allentown and Bethlehem, Pennsylvania.